Pronunciation Guide. Both a long elaborate description as well as a short concise description for each sound in Mandarin Chinese. As a follow-up to the previous blog post, here is another "paint by"-pdf. 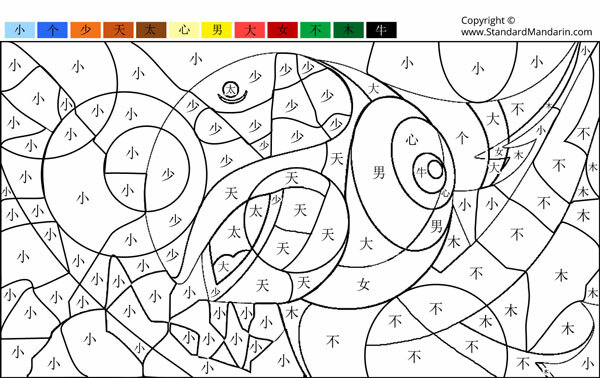 This time the exercise is not about recognizing the radical, instead it is a "paint by Chinese character". There is also a lot more colors in it. Below is a preview of the file. Please click here to download it. It is becoming increasingly popular to enroll toddlers and small children in Chinese lessons. How do you motivate them to learn Chinese? Being a father myself, I know the challenge of teaching a western kid Chinese. It is absolutely not an easy task. If you are facing the same challenge, perhaps you have made your own experiences in this regard. Please let me know what you have found, you are welcome to share your thoughts in the comments section below. How do you say "thank you" in Chinese? It is very straightforward. Please do read on! This blog post will not waste your time with unscientific babbling. Is it really possible to do so-called "sleep-learning"? What is sleep-learning? 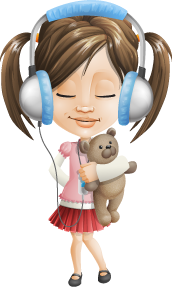 In short, sleep-learning is to listen to some audio recording while you're asleep, in the hope that you'll somehow recall the content when you wake up.